Goldens' Cast Iron was founded over a century ago as Goldens' Foundry and Machine Company. They were among the best producers of cast iron in the United States. Goldens' Cast Iron was spun off from the still existing parent company so they could enter the market of manufactured cast iron goods. Their first products were syrup kettles used to boil sugar cane or sorghum juice down into cane syrup and molasses. These provided the inspiration for their current fire pits. Coming in sizes of 20 gallons and 30 gallons, these are made of a single piece of molded 1/2-inch ductile cast iron. They are so durable, your family will be able to own one for generations. 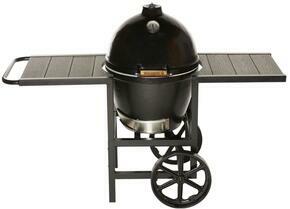 They subsequently got into the business of manufacturing kamado cookers. Whether you need a 14-inch mini cooker for small get togethers or a 20.5-inch cooker for a large back door celebration, there's a Goldens' Cast Iron kamado grill for you. You'll have absolutely no problem searing steaks, smoking a slab of ribs or roasting a lamb shank. Controlling temperature is so precise you'll even be able to bake in these cookers. 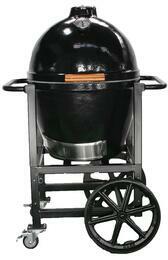 Best of all, these kamado grills are proudly manufactured in America. No outdoor kitchen is complete without a Goldens' Cast Iron kamado grill. Shop Appliances Connection today for the Goldens Cast Iron that are right for you!